✅Invisible switch: The "on/off" hole was designed for waterproof reason. Just use the supplied key pin to insert the switch hole. When hearing the "click", the lighting system is unlocked. 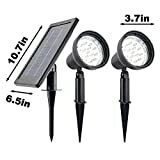 ✅Ultra-Bright Solar Deck Lights: High-powered 20 LEDs provide excellent illumination of up to 160 lumens. This is bright enough to turn night into day and provide security for your home or business. No worry about being outdoors in the dark at night. 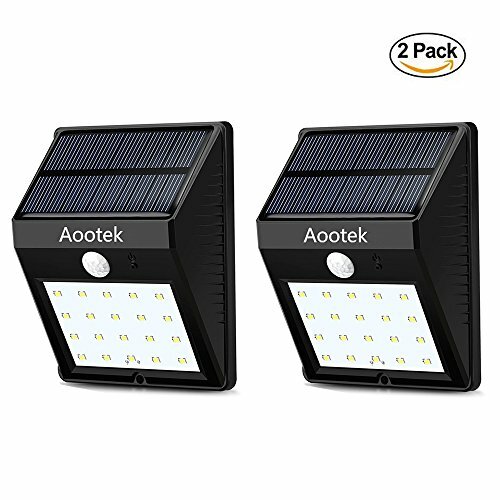 ✅Automatic Motion Sensor Solar LED Deck Lights for Security: The solar deck light turns on automatically in the dusk and turns off at dawn. 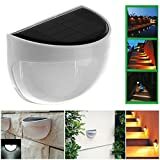 Dim Light Sensor Mode: when in dark night, the solar deck LED light will be dim without people coming near, however become bright if people comes, and the bright light will last 15-20 seconds until it returns to dim light again. ✅High Efficiency and Eco-Friendly: This light is charged by exposuring to sunlight in day for around 8 hours. Then its rechargeable 1000mAh Li-ion battery can store the power for over 8 hours working time at night. 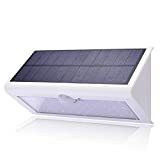 ✅Solar LED Sensor Light with a large sensor - sensing range of 10 feet with a 120 degree sensing angle.IP65 waterproof and heatproof, solar powered lights, suitable for most kinds of weathers. 1.Integrated design of PIR motion sensor and night sensor. 2.Recharged by Sunlight and store power for overnight lighting. 3.Over 8 hours lighting time after 8 hours charged under ideal bright sunlight. Dim Light Sensor Mode: when in dark night, the solar deck LED light will be dim without people coming near, however become bright if people comes, and the bright light will last 15 seconds until it returns to dim light again. It is designed for longer product life. 1. Unlock the product, charging the solar light by direct sunlight around 8 hrs. 2. Cover the solar panel with your hand, if the light is on, the product is working. 1.Unlock and activate the solar led deck light The internal battery is locked from factory for safety shipment, so users have to use supplied Key Pin to click the "on/off" Switch Hole and unlock the battery and lighting system. It will auto turn on Dim light when in darkness or at night, and auto turn off when in daytime or bright area. If there is no plenty of sunlight in 3 months, the battery may be out of power, so you have to charge it by bright sunlight. When it's fully charged, please use Supplied Key Pin to unlock the device and lighting system, otherwise, it can't work anymore.